Are there any suggestions for such an IDE out there? I actually think the idea of a single, unified, development environment like what you're after is somewhat antithetical to OS X design principles. One of the great things I've found, since switching to OS X for development work about a year ago, is that many OS X application developers share my own personal philosophy when it comes to software: do less, but do it really, really well. As such, my current development environment on OS X is less unified than it was on Windows or Linux, but far, far more stable, robust, and ultimately: productive. For coding I use TextMate. It seems almost trivially simple at first and then you discover bundles and it's built-in command line filtering and it takes off. It will handle the highlighting tasks you requested. It has projects, and while they seem kind of loose at first, you'll grow to appreciate it. Trust me. And it does handle code completion, tag closing, tag matching -- the sort of stuff you'd expect -- it's just not obvious, but it's there in Bundles and waiting for you to customize it. 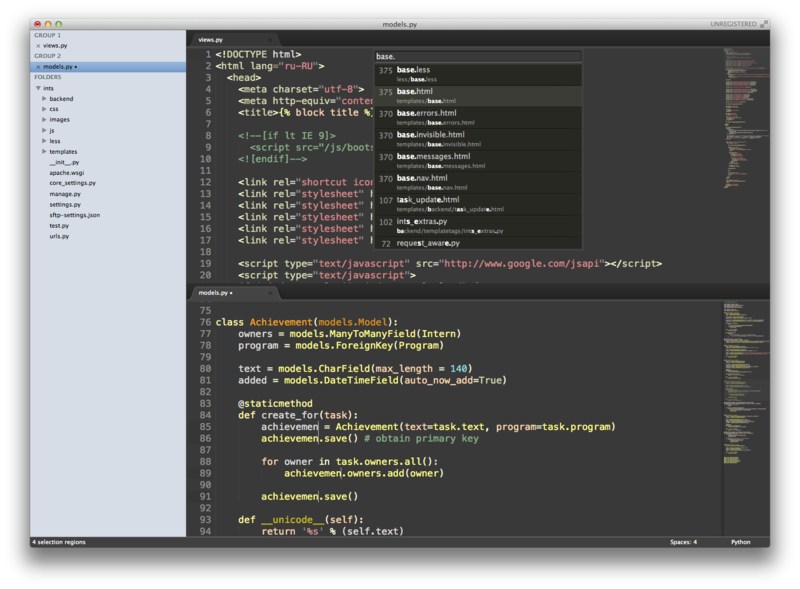 Update: I've moved off TextMate and on to Sublime Text 2. The regular updates and the Python-based extensions were a major draw. It's been a year now and no regrets with that switch. I use Kaleidoscope for diffs. It's just an a beautiful diff tool. My git tool is Tower and my Subversion tool is Versions. Both awesome. For permanent, remote drive access via ssh I use MacFUSE to connect to the remote location and mount it as a drive on my Mac. This is a superior option to built-in ssh or ftp support in the IDE because all the programs on my Mac can now work with files on that share. Update: I've switched to ForkLift 2 as my primary means to interact with remote file systems. It's got a nicer UI than CyberDuck and a few less "quirks" to it. I'll still occasionally open up CyberDuck when I need to deliver a signed URL to an S3 object. Finally: iTerm 2. A terminal app befitting OS X. It really is quite a fantastic terminal. Bookmarks make it easy to get to my AWS machines quickly. The UI is clean. And tabs. All of those things replace the clunky IDE (Komodo Pro) I use to use on Linux and Windows (and never really liked, just tolerated). And I don't even know that they're not all "unified" in one cluttered, modal window. No sir. Update: There's more Go in my day to day coding now. My toolset integrated that relatively young language without so much as a hiccup. 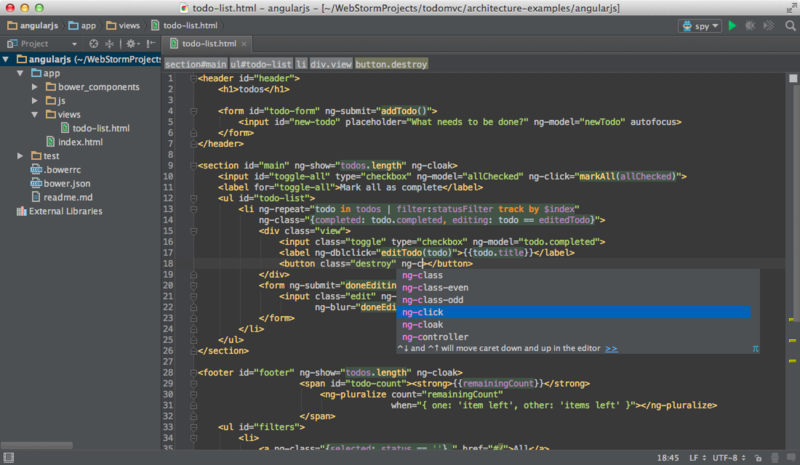 It's not an IDE, but the Vim editor does everything that you have asked for and much, much more! Check it out, it's freaking awesome. You can go for NetBeans, it's quite good and I prefer it. Oddly there is no mention of Eclipse yet. Its not just for Java, there are plugins for almost all the languages out there. I've used it on my MacBook Pro for years. I find the open source Atom the best! Atom is a text editor that's modern, approachable, yet hackable to the core—a tool you can customise to do anything but also use productively without ever touching a config file. I've been impressed with Aptana 3 - give it a try. It has Smarty support. For web development in particular, there is Coda. I would also recommend Textmate from Macromates. 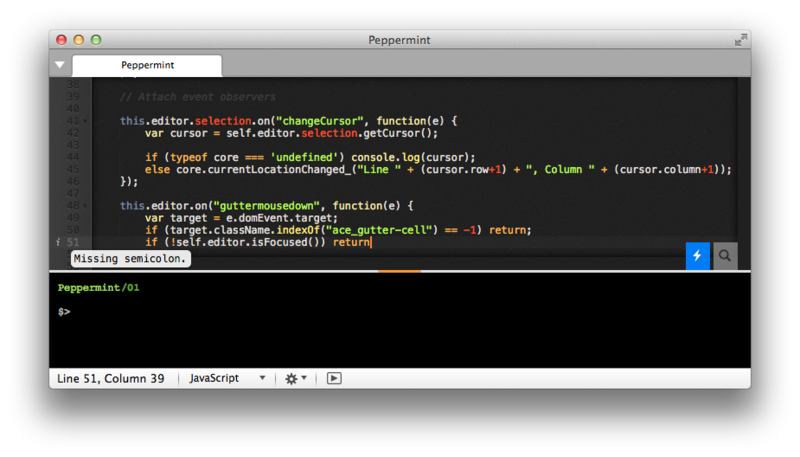 You can customize syntax highlighting if you want too. Have a look at the features. I have tried SubLime , it is brilliant in looks . And one of the best thing about it is the fact that even if you force quit it , it will retain state of the app . So all of the tabs you were working on will get restored . It's much needed when you accidently close the app . About TextMate , that's nice too . But Sublime is certainly +1 . I don't know if this will strike as promotional, or not, but guys, I can't help not to talk about our own... brain child, Peppermint. Brackets is a free Adobe product originally written for HTML. Like several others here it has a great many plug-ins to enhance its capability. I've used it for HTML development and it works great. Can also do many other languages with the plugins. Python, Ruby, etc. It has yet to crash on me. New free upgrades around every 6 months. How about NetBeans for OS X? Not the answer you're looking for? Browse other questions tagged macos software-recommendation development text-editor . A C/C++ IDE for OS X that isn't Xcode? An alternative to the text editor TextMate for PHP development? Is there a free, lightweight text editor that isn't text-only but also isn't a heavyweight IDE? IDE for R in OSX?